Hi! Welcome to kidscookdinner.com. We’re Max and Alex Koster and this is our blog where we talk about cooking and eating and try to encourage kids to cook. 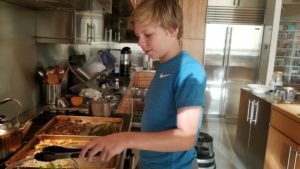 To learn more about the history of this website, and our cooking adventures, scroll down to the next post. 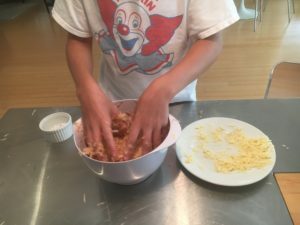 To read about what we did today…stay right here! Today I (Max, because Al is still at sleepaway camp) wanted to celebrate summer by making one of my favorite summer desserts: Blueberry Crisp. 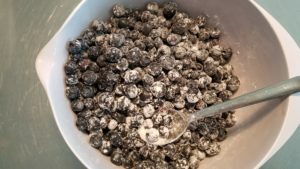 Usually we pick the blueberries ourselves at a great berry farm in upstate New York but we were stuck in the city this weekend so we bought them instead…they were still yummy. The steps to make blueberry crisp are pretty simple. 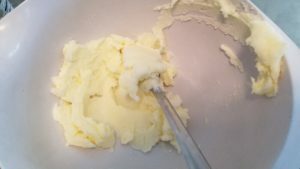 First, about an hour before you are going to start, put out a stick of butter to soften. 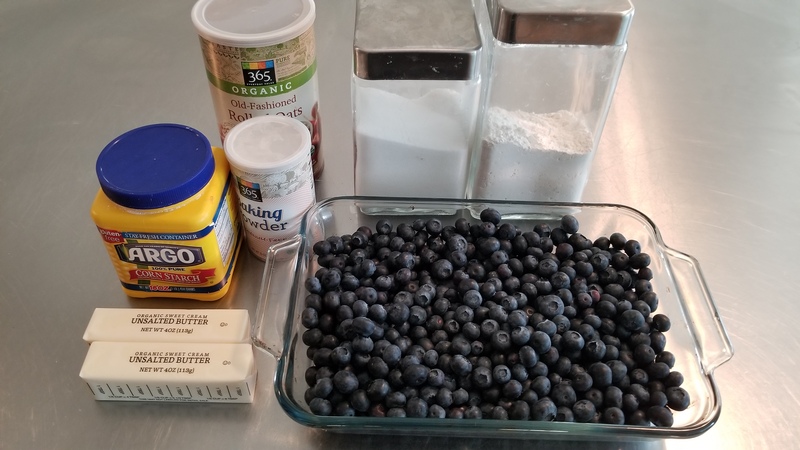 Then, once its softened you have to 1) prepare the blueberry filling and 2) prepare the topping. 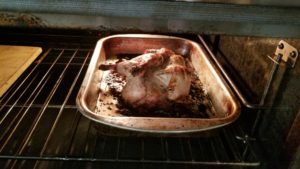 And of course preheat the oven to 375 degrees. 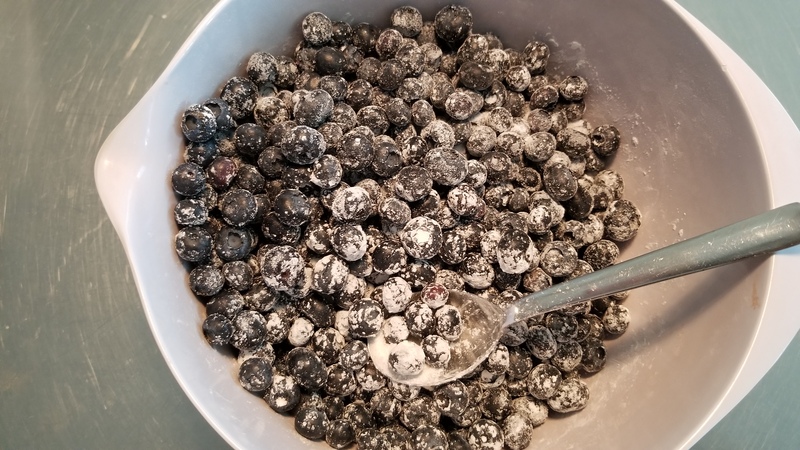 For the filling you need 6 cups of blueberries, 1 tablespoon of cornstarch and 1/2 cup of sugar. 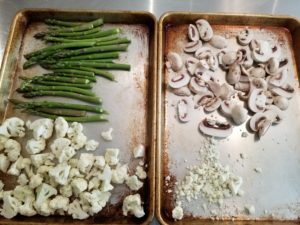 You mix all these together and the put in a baking pan. For the topping you first blend 6 tablespoons of softened butter with 1/3 cup of sugar. Then you mix 3/4 cup of rolled oats, 1/2 cup of flour and 1/2 teaspoon of baking powder and add that dry mix to the creamed butter/sugar. 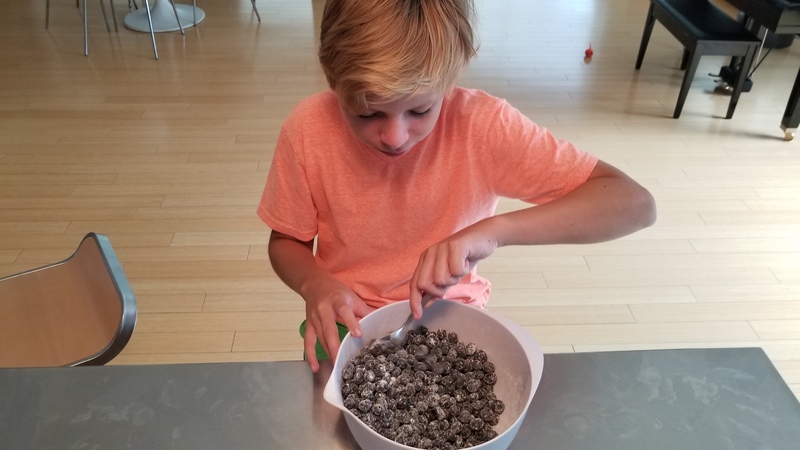 You mix that all together with your hands and then you sprinkle on top of the berry mix. 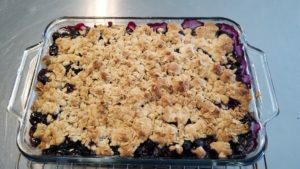 Bake that in the oven for approximately 45 minutes or until the topping is golden brown and the blueberries are bubbling. DELICIOUS! Hi! 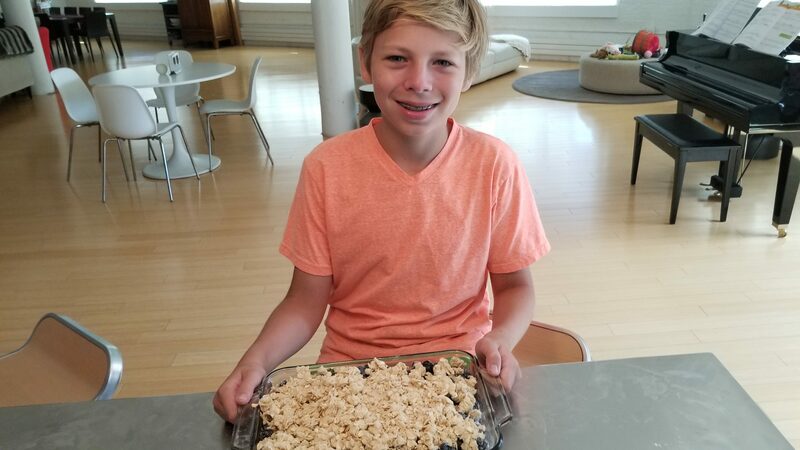 Welcome to kidscookdinner.com. 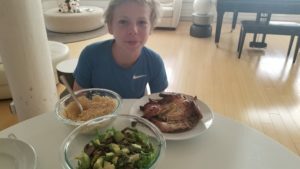 We’re Max and Alex Koster and this is our blog where we talk about cooking and eating and try to encourage kids to cook. (Alex is at sleepaway camp till August so I (MAX) am in charge of kids cooking and the blog.) 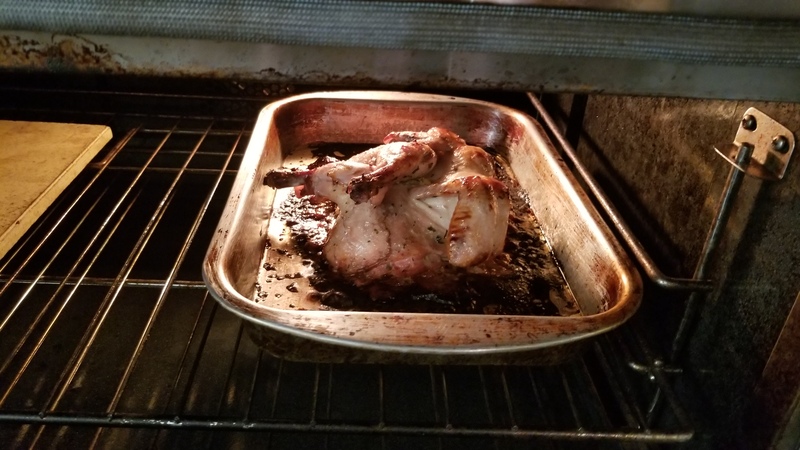 Tonight I wanted to try out making spatchcocked chicken. I also wanted to roast some vegetables that were in our fridge and needed to be cooked or eaten (or both) so I roasted cauliflower, asparagus and mushrooms and tossed them into a bowl with arugula and avocados. I also made some couscous to go on the side. Ok so to spatchcock chicken, you have to cut out its back bone (do this with the chicken breast side down, back bone up). 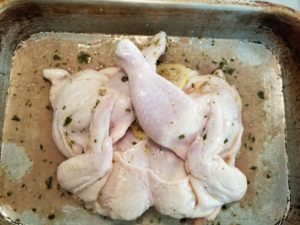 Then you have to put the heel of your hand on the chicken and push down to flatten the chicken. This allows the chicken to cook faster and more evenly. 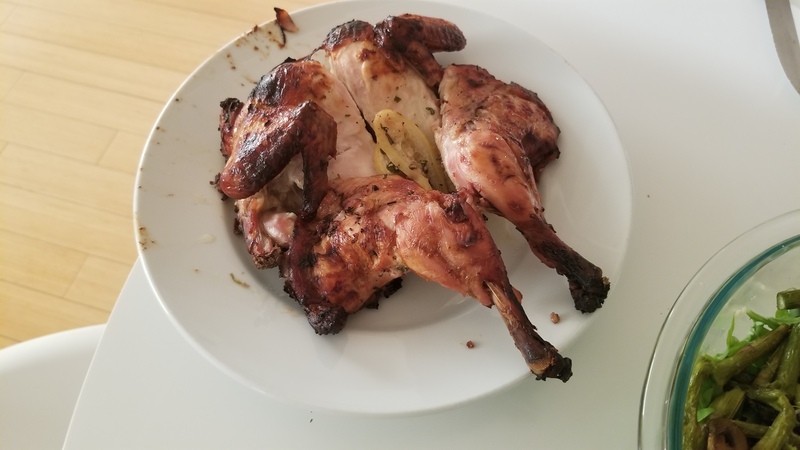 But you have to be ok handling a whole chicken…and cutting it up. 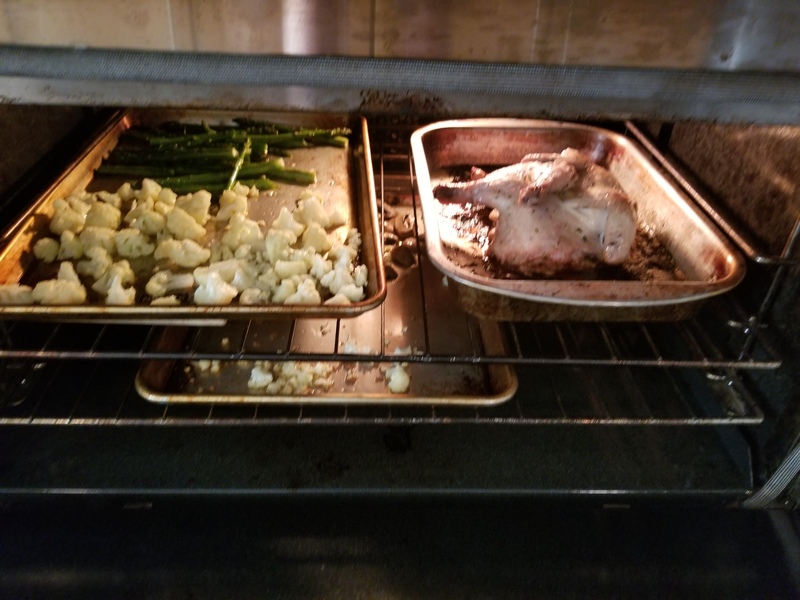 To make this, I chopped up cauliflower, aspargus and mushrooms, tossed them in olive oil and salt and pepper and then put them in the oven on sheet pans with the chicken (but I put them in after the chicken had cooked 30 minutes: the veggies need at most 20-30 minutes). 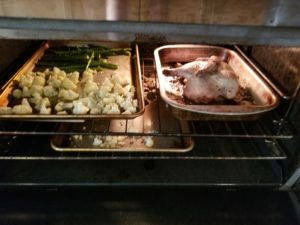 After 15 minutes, I flipped over the veggies so they would get evenly brown. 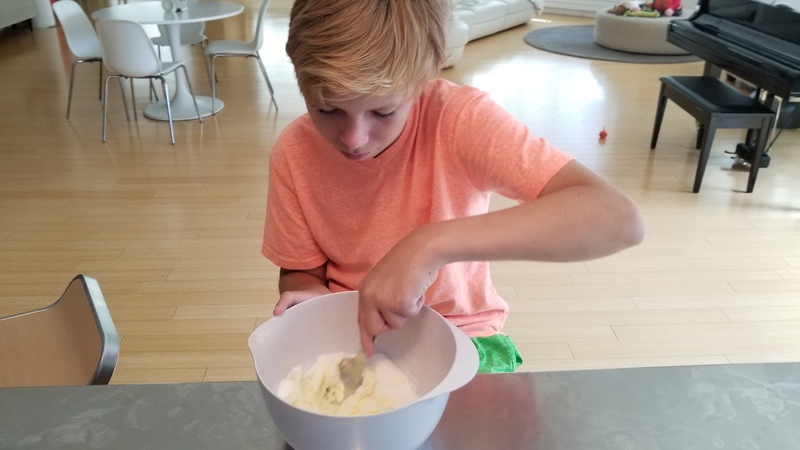 OK this is pretty easy: just remember with cous cous, the ratio of liquid to cous cous is 1:1 so if you want a cup of cous cous, boil a cup of water, remove from heat, stir in the dry couscous and let sit, covered, for 5 minutes. (It’s ok if you put a little more than 1 cup of water in because some usually evaporates). Anyway, after 5 minutes, fluff the cous cous with a fork. 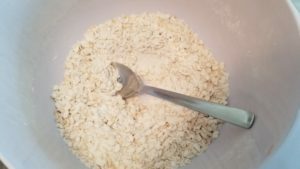 Don’t forget, otherwise the cous cous can get sort of caked together. I like to add a little butter as well. Today in honor of Switzerland’s World Cup soccer game against Sweden, and because I am Swiss-American. 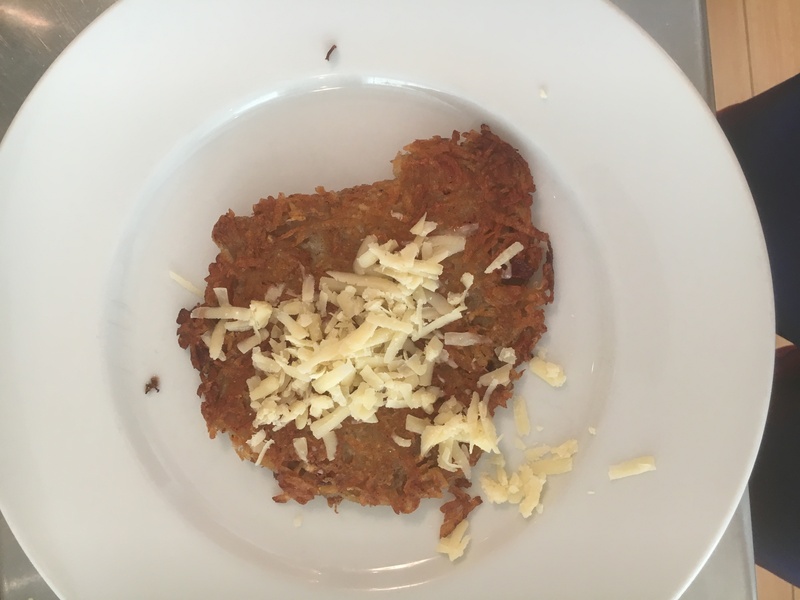 I decided to make Rosti: essentially a Swiss potato pancake. To make mine really Swiss, I added gruyere cheese. But since I’m also American, I added chopped bacon. 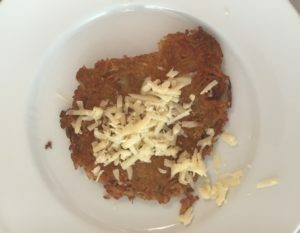 Alas, Switzerland lost to Sweden…but the Rosti were still good. The ingredients for Rosti are pretty simple: potatoes, butter and salt. 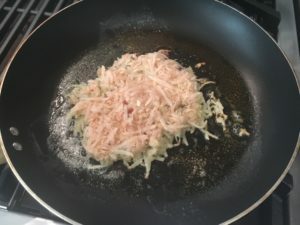 In my version I added chopped bacon (already cooked) and grated gruyere cheese. 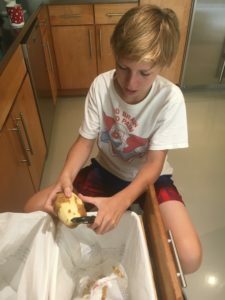 The first step is to peel the potatoes. Then you grate the peeled potatoes with a box grater and then squeeze as much water out of the grated potatoes as you can (a lot comes out). 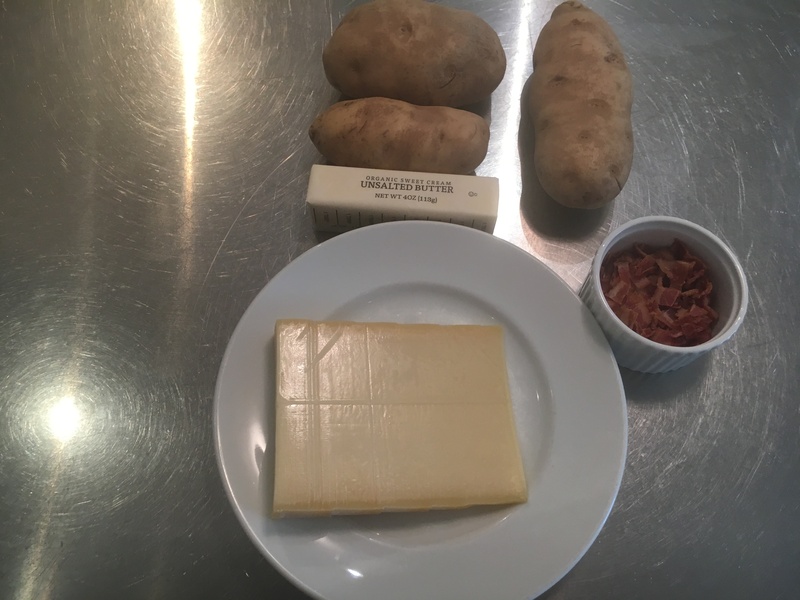 Don’t worry if the potatoes start to turn brown: you are going to cook them anyway! 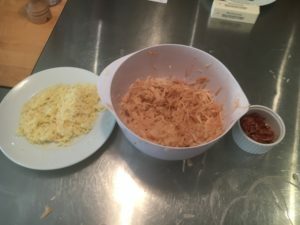 After you have squeezed as much water out as possible, mix the cheese and bacon in–by hand is best. Finally it’s time to cook them. Heat a couple of tablespoons of butter in a nonstick pan (medium heat) and then put a mound of the potato mix in. Flatten it to about 1/2 inch and let cook 7-10 minutes till golden brown and then flip and let the other side cook to golden brown. 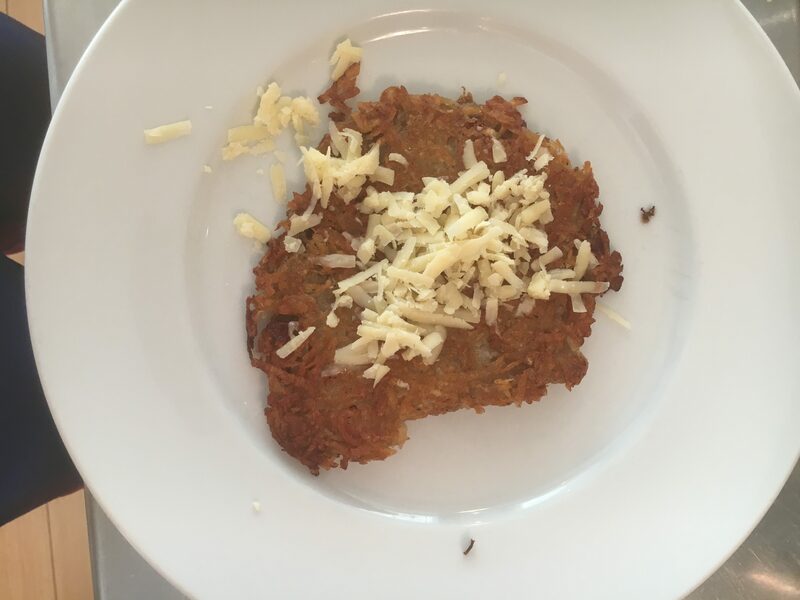 Start out with a pancake size rosti…the traditional rosti is the size of a plate but those are really hard to flip so its better to start a little smaller. Remove from heat and sprinkle more gruyere cheese on top, and then enjoy (preferably while watching Switzerland WIN a soccer game).